Set up in 5 minutes! Small in size, mount and hide anywhere! This 4-Channel Wireless A/V Transmitter & Receiver kit can be used by professional video photographer, news and film directors/producers/studios for easy and quick setups! It is also the best product used to watch your baby in another room or watch your kids in the yard! Great for value-added product/application developments. Vendors/Retailers/Business customers are WELCOME! With four of this 4-Channel Wireless Transmitter & Receiver kits, you can connect up to 4 different A/V sources (e.g. Micro Cameras, one at each pre-set locked channel/frequency) and transmit simultaneously without interference! Long reception range, High sensitivity, Low power consumption, Low maintenance, Small compact size, Minimal weight, Easy installation, operation, and concealment! It is great for value-added product/application developments! 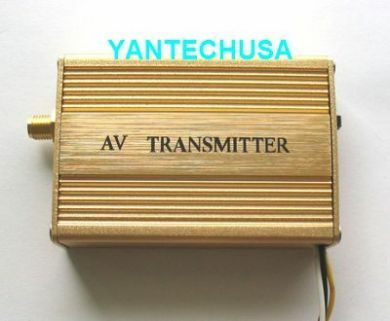 Locked frequencies/channels: transmits and receives the best quality picture! Watch camera man's video shooting on director's monitor without running cables! Internal cooling fans: more effective! "4-Channel" means with four of this 4-Channel Wireless Transmitter and one Receiver sets, you can connect up to 4 different A/V cameras, one at each preset locked channel/frequency, and transmit simultaneously without interference! Build on - Add a Quad Process to multiplex 4 wireless video inputs and show them on the same screen in split sections, like what you see with professional surveillance monitoring system! Attach to Micro Cameras and make a wireless 4-Camera surveillance system in no time - we provide Micro Cameras at discount when you purchase with this wireless AV Transmitter & Receiver! Note: Actual reception result might vary due to different environmental and topographical conditions. Wireless transmission reception result can be affected by a lot of factors such as there are objects between the transmitter and the receiver, the structure/material of the building environment, the above ground clearance distance, whether the transmitter and/or receiver is moving, other electronics and appliances in the same environments, the topology, the temperature and humidity, whether there is a LOS, etc. The LOS range in the specifications is the manufacturer lab rating in a "perfect" environment. CAUTION: Remeber to attach antennas for both the transmitter and the receiver before the system is powered on to avoid permanent damage. Please consult your legal advisor if you need to obtain license for operating the device(s). The manufacturer or the seller of this device(s) are not liable under any circumstances if the device(s) is used for illegal purposes, offenders are subject to severe legal punishments by government law enforcement agencies. 1.Connect the antenna of receiver to the receiver (note you must attach the antenna before power on the receiver to avoid permanent damage). 2.Connect the AUDIO and VIDEO OUT of receiver with the AUDIO and VIDEO IN of monitor using AV cable. 3.Connect the antenna of transmitter to the transmitter (note you must attach the antenna before power on the transmitter to avoid permanent damage). 4.Connect the signal input connector and vidicon using special cable. 5.Plug regulative power plugs of DC power transformer into the jack of receiver power. 6.Power on the receiver with supplied DC12V 500mA/1A power supply. 7.Plug regulative power plugs of DC power transformer into the power jack of special cable. 8.The channel of receiver and transmitter must be matched. 9.Adjust transmitter/receiver antenna if necessary to reach best signal quality.